Anastasia took on a job teaching at a nearby Catholic school to make ends meet. She was known as a firebrand on the goldfields, frequently complaining about how the miners were treated by the authorities. In 1854, she encouraged her husband Timothy to take a leading role amongst those in Ballarat who were expressing their dissatisfaction with conditions on the goldfields. Timothy Hayes became chairman of the Ballarat Reform League and, on Wednesday 29 November, at Bakery Hill, he chaired the ‘monster meeting’ which set the scene for the Eureka Rebellion. After the rebellion was crushed, Anastasia was at the forefront of the resistance. She was involved in the operation when Peter Lalor’s arm was removed to save his life. Anastasia was disappointed that her husband was one of those arrested and when she approached the troops, she told them, ‘I wouldn’t have been taken by the likes of you’. She took her six children to court in Melbourne and sat in the court suckling her youngest while her husband was on trial for High Treason. She is also credited with being one of the three women who made the iconic flag (see link at bottom). There are a lot of other sites about that give biographical information, photos etc., so I’ll link to them below the obituary. The many friends of Mr E. Hayes, a popular captain of the Militia, will regret to hear of the death of his mother, Mrs Anastasia Hayes, of 22 King street, which took place yesterday at her residence. The deceased lady, who was 74 years of age, had been ill for some weeks, and died peacefully shortly before noon. Although her system had been gradually breaking up for years, she retained her mental powers to almost the last, and until very shortly before her death was closely observant of all that was going on around her. Mrs Hayes took a prominent part in the most stirring times connected with the history of Ballarat, having resided here since 1832, in October of which year she arrived in Port Phillip with her husband and five children. Early in 1833 she was appointed by the late Dean Downing to the charge of the Roman Catholic school which he was then establishing, on the site where St. Alipius’ Church now stands. It was whilst Mrs Hayes held this position that the exciting events that culminated in the Eureka Stockade took place, and the deceased lady was acquainted with the leaders of that movement. On the morning of the 3rd December she encountered the troops returning from the storming of the stockade, and seeing her husband handcuffed between two horsemen, she, at great personal risk, reached his side, and forcibly remonstrated with his captors. After the committal of Mr Hayes in connection with the outbreak, although having the care of a young family, the now deceased lady attended closely on the wounded leader of the diggers, and was present and assisted the doctors at the amputation of his arm, afterwards, in company with Mr M’Grath, the schoolmaster, disposing of the dismembered limb in an abandoned shaft at the rear of where St. Paul’s Parsonage, now stands. She leaves two sons—Mr E. Hayes, of King street, .and Mr T. Hayes, of the Victorian railways. 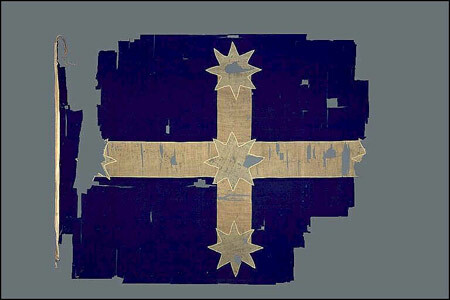 Museum of Australian Democracy at Eureka: Who made the flag? (with a photo of Anastasia). For some years past the lady to whom we have referred has occupied the position of school-mistress in the Roman Catholic Denominational School. She has done so up to a very recent period with satisfaction to the church authorities, to the parents of the children placed under her, and with evident advantage to the children themselves. The first differences of opinion arose during the last election for this district, when, in consequence of the hostility of the spiritual authorities, towards Mr Lalor and his views on the Education question, the husband was directly threatened by the then pastor in charge, that his wife should be dismissed from her situation if he dared to interfere in promoting the election of Mr Lalor, then going for ward. The threat, however, was suffered to remain in abeyance until some six weeks since, when, in consequence of a refusal to liquidate some monetary obligations incurred by Mrs Hayes on behalf of her husband while he was a state prisoner, she was dismissed. The lady took steps to open a school upon her own account. When this became known, the Reverend gentleman who appeared before the Court yesterday and Monday interfered, and peremptorily told her that she should not be allowed to keep a school in the district, a fact the gentleman refused to corroborate in the Police Court, though he would not deny it. A very detailed (and long) account of the trial was published in the Star the previous day.